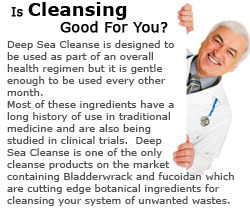 Deep Sea Cleanse is a Powerful yet Gentle Natural Option to Remove Unwanted Wastes and Dangerous Environmental Impurities from your System. Revitalize your immune system so you can ward off bacterial and viral attackers. Help to repair a painful and malfunctioning digestive system. Never suffer from painful bloating, gas, heartburn or constipation needlessly again. Dramatically improve the look of your nails, hair and skin. Your skin is your largest organ and one of the first to show the effects of built up wastes. Cleansing can restore the healthful look and feel of your nails, hair and skin. Work wonders on your stamina and energy levels. After Deep Sea Cleanse, you'll notice a boost in your energy due to your efficient use of fuel and optimal cellular performance. Get the best nights sleep you've ever had and wake well-rested. It's a Fact: Scientists have recently concluded that sea vegetables offer the broadest range of minerals of any food found on earth. Western cultures are only recently beginning to discover the nutritional value of sea vegetables which have remained the foundation of the Japanese diet for centuries. 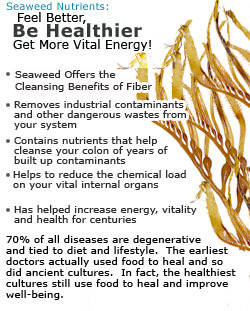 But even more importantly, current science is showing that alginic acid, polysaccharides and fucoidan found only in seaweeds can help to cleanse not only your digestive tract, but your blood, skin, liver and kidneys as well. Deep Sea Cleanse is an Enhanced Seaweed Cleansing Blend. Oceanic Naturals believes that our oceans are indeed the most promising source of natural solutions for today's top health concerns. 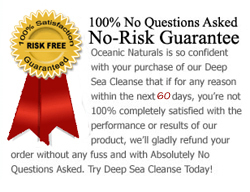 It's for this reason that Oceanic Naturals is proud to introduce Deep Sea Cleanse. Deep Sea Cleanse is an indispensable Cleansing Blend which harnesses the ocean's power in capsule form in order to help you gently and thoroughly clear your body of built up wastes and balance your essential vitality, naturally. Deep Sea Cleanse not only helps you to boost your immune function and improve your overall vitality; it can also help you enjoy deeper, more restful sleep, help with improved energy levels, support healthy blood sugar levels, support a healthy liver and kidneys, improve the look and feel of your hair and skin, and, support a waste free circulatory system. We've created Deep Sea Cleanse in a convenient capsule form with the right combination of natural ingredients to take the guesswork out of cleansing. All you have to do is take one to three capsules with water and a meal and let nature do the rest. Unlike other cleanse products on the market, Deep Sea Cleanse is the only one to take advantage of the awesome power of the sea to work with our bodies and take out what was never meant to be in there. Humans are, at their very essence, almost the same chemical composition as seawater. Deep Sea Cleanse works in this familiar environment to replace nutrients that are depleted so the body can perform at its peak levels to efficiently remove wastes and supports the cleansing of the major organs of elimination to leave you restored and rebalanced. Deep Sea Cleanse is gentle so you can use it as an occasional cleanse or every other month, yet it is also one of the most effective products available today. * These statements have not been reviewed by the Food and Drug Administration. This product is not intended to diagnose, treat, cure, or prevent any disease. Individuals shown are paid models and not necessarily Deep Sea Cleanse™ users.